Out of the box, our reporter trekked 18 mountainous miles with the just-released Merrell Chameleon 7 boot. Rocky trail, steep hillsides, and more than 18 miles round-trip. That test faced my feet in the Merrell Chameleon 7, a fast-and-light hiking boot. Our destination was Conundrum Hot Springs, an 11,225-foot-high oasis in the epic alpine terrain above Aspen, Colo. Trail conditions included mud to snow, with multiple stream crossings, roots, log bridges, and talus added in for good measure. Merrell invited me to make the hike and test its newest boot. The Chameleon 7 is the latest iteration of the brand’s leading boot franchise—since 2001, the Chameleon has served as a tried-and-true hiking boot. 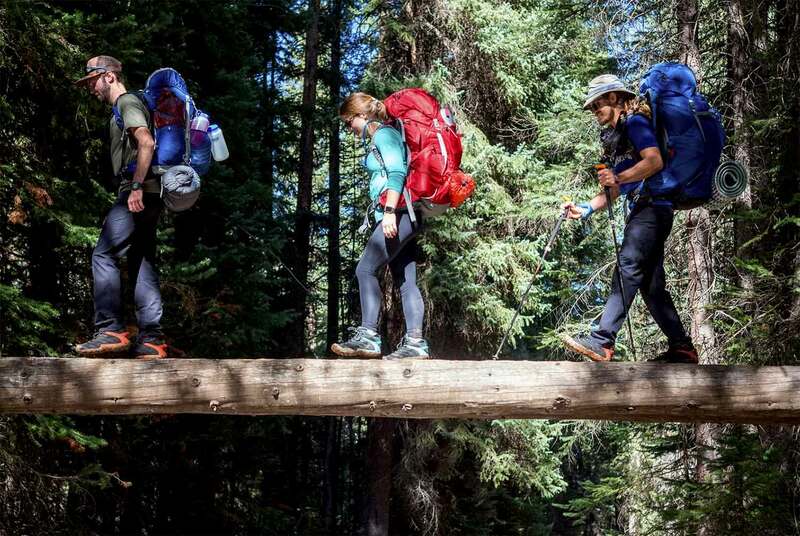 For sale this month, version 7 takes cues from trail-running shoes to move fast but with protection and stability to handle big packs and dicey terrain. The waterproof, lightweight hiking boot comes to market this month in men’s and women’s builds and costs $170. Read on for my review of the Merrell Chameleon 7, which I hiked in while wearing a 58-pound pack, uphill and down, during early-autumn Colorado bliss. From the trailhead off Castle Creek Road, we trekked nearly 3,000 feet up into the Maroon Bells-Snowmass Wilderness. Conundrum Hot Springs is a popular destination, with sublime forests and jaw-dropping views. It’s capped with its namesake hot spring, which pumps in geothermal glory to offer weary hikers 100-degree F water in a setting you will never forget. Our business for the week was a boot test. I lean fast-and-light on most adventures, but here I packed large—my aforementioned 58-pound load included camera gear, camping equipment, food, and my requisite slackline for fun at camp. The Chameleon 7 is the latest in a line of boots under this name, and it’s among Merrell’s most successful models. Upgrades for 2017 include lighter weight, an outsole audit, and the company’s FlexPlate technology, which serves as a supportive but dynamic platform between the midsole and the tread. Unique, oval lugs on the Vibram TC5+ outsole gave grip. The brand touts they are “placed precisely and only where needed,” and I agree. The bottom of this boot is a strange but effective configuration. It seemed pared-down to attach to dirt, mud, snow, and any surface underfoot. It has a waterproof membrane under a leather and mesh upper. Metal hook eyelets offer secure lacing. 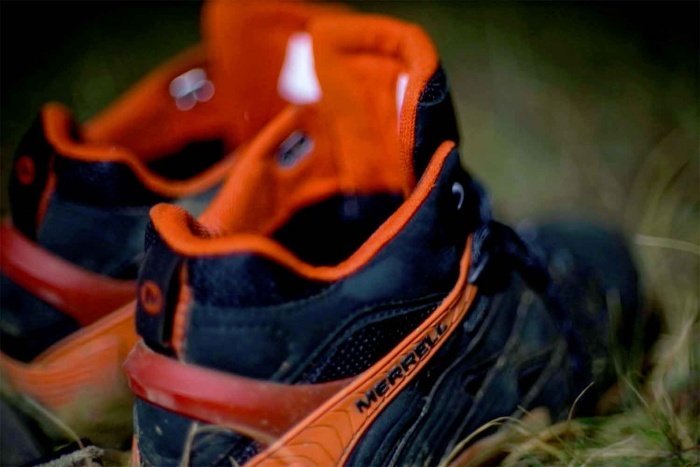 The boot offers a protective rubber toe cap and is just burly enough, though Merrell keeps the weight down. A size 9 men’s boot is about 17 ounces per foot, just a few ounces more than a beefy trail-running shoe. Overall, after the Conundrum Hot Springs hike and some subsequent wear, I am happy with the Chameleon 7. It’s a solid choice for anyone in need of a stout but nimble boot. During the journey uphill to Conundrum Hot Springs, we hit trail conditions on a spectrum from multiple stream crossings to mud, snow, ice, talus, roots, and log bridges. It was a typical fall trip, in the high 70s during the day and dipping below freezing at night. I put the boots through some normal (and a few obscure) tests along the way. Dunk Test: At 3:00 p.m. (about three hours before dark) I stood in a stream, allowing water to fill the boots. My issue with waterproof boots is their dry time once wet, thus I wanted a blunt-force test. I then hiked in the boots for three more hours, sloshing until camp was set. Overnight, I set the boots out to “dry.” But the remaining water froze solid, and in the morning, with fresh socks on, I wore the boots around camp. Within about two hours, the boots and my socks were dried from my body heat. Mud: We encountered a lot of mud on the hike, and the boots fared well. The 3-mm lugs did a nice job gripping in thick, deep mud, even when hiking uphill. Tip: If you are on a super slippery surface, don’t propel yourself forward. Rather, keep even contact with the ground and move your body over the stable leg from the hips. It’s kind of how you would walk without knees. Snow: Great grip on everything but glare ice. The Vibram lugs shed the snow with each step, providing maximum traction both up and downhill. I was impressed. Ice: As long as there were patches of dirt within the ice, you could manage to walk down a 15-degree slope without losing control. The lugs provided a predictable and steerable slide should your foot break free. Talus: The boot excels in talus. With a 50+-pound backpack, I easily rock-hopped through the talus. Unlike a rigid-sole boot, the flex plate in Merrell’s protects the foot from feeling the individual lugs through the bed of the shoe. But it is flexible enough to provide contact no matter how pointy the rocks are underfoot. Wet Rock: I was amazed again at how well the Vibram rubber performs and the flex plate allowed the 3-mm lugs to conform to the contours of the rock, providing stable footing on shear, wet surfaces. Roots: Like most footwear, there was not much traction on roots. But with a bit of practice, the boot flex plate allows for a predictable and stable slide on roots; it sort of grips around them at times. Transitions: This is where the boot stands out the most. Due to the separation between lugs, this boot sheds even the most sticky mud on the trail. So when stepping from mud to rocks, every step is solid and stable. Temperature: At lower elevations in the middle of the day (75 degrees F), I was overheating, but my feet felt great. As the temperature dropped (40 degrees F) at higher elevations, even with wet feet, during 20-minute breaks they stayed warm. Waking up (28 degrees F), the shoes were frozen, but in less than 10 minutes my feet heated them up. Lacing: Strong, paracord-style lace was easy to tie and untie even when wet, muddy, or frozen. I double knotted one shoe and left the other normal when tying frozen laces. Within a mile, the non-double-knotted lace came untied. Overall, they feel sturdy yet supple. The All-Important Slackline Test: I usually go barefoot, but the boots passed here! (See photo above.) We set up multiple slacklines on the trip, including at camp and in the hot springs. With the peaks of the Maroon Bells Wilderness as a backdrop, the boots enabled balance walking the thin line. Overall, the Chameleon is good for hikers who need footwear a little heavier than a trail-running shoe, but lighter than many boots. They’re for the hiker who needs nimble and waterproof footwear with protection and support.